The Doctor and her newly recovered TARDIS are still working out the kinks. In attempting to get her three companions back to modern times Sheffield, the Doctor mysteriously ends up in 1955 Montgomery Alabama. The Doctor detects traces of ‘artron energy’, the energy the TARDIS runs on, all around the area. The companions are excited to have a little time travel adventure in the past, until reality quickly catches up with them. Ryan attempts to do a kind deed for a local woman when he is promptly assaulted by her husband. He is threatened with a noose around his neck for touching a white woman in Alabama. Tensions begin to rise until another local woman comes to their rescue. She diffuses the tense situation and sends the offending couple on their way. Afterwards, she introduces herself as Rosa Parks. The Doctor and her companions are a bit star struck and try to play it cool as they meet one of the great figures of history. Rosa says her goodbyes and tells the group to leave Montgomery as soon as possible. The Doctor tries to piece together why the TARDIS would bring them to Montgomery just in time to witness Rosa’s moment of fame, and why the mysterious Artron energy surrounds her life. A strange man with futuristic technology confronts the Doctor and companions and threatens them. He recognized the Police Box as the Doctor’s TARDIS and begins stalking it to try and attack the group. The Doctor and companions hide out at a local motel to come up with a plan of action. Ryan and Yaz experience more of America’s pre-civil rights movement racism while around Montgomery, being kicked out of a whites only restaurant and hiding from police outside of a whites only motel. They bond over their mutual situations and circumstances growing up experiencing name calling and racial profiling in modern day times. The Doctor manages to track down and confront the time-travelling dissenter and grill him for more information. She learns that his name is Krasko and he is a ‘reformed criminal’ from the 79th century future. He alludes to his time in jail for a crime that in injured thousands of people. He has a chip implanted in his brain that physically will not let him harm or kill any other living thing ever again. And yet, here he is in the past, attempting to influence the flow of history and keep millions of people in horrible racial discrimination. The Doctor promises to do everything in her power to stop him. The companions and the Doctor buckle down to protect the timeline from Krasko. They ensure that the bus driver is back on duty for his night shift, and the bus is in perfect working order after getting vandalized by Krasko. Ryan goes on a mission to recruit enough bus riders to fill the bus enough to make Rosa have to give up her seat on the fateful night. He also confronts Krasko, who is blocking the road in a last ditch effort to thwart history. Ryan uses Krasko’s technology agaisnt him and zaps him back as far back in the past as his temporal displacement weapon will go. Their plan is almost perfect, until they realize that they must stay on the bus and take up the last remaining seats to make the moment in history happen. Graham has a crisis of conscious over being the reason that Rosa must make her stand and get arrested. He feels guilty for being the last straw in her life to make her stand against the law. He watches as Rosa makes her stand, protests against the law, and gets arrested. Back in the TARDIS, the Doctor shows the companions the ripple effect that Rosa’s actions have on the civil rights movement. They show their appreciation for her actions and her life’s work in righting the wrongs in the world. The Doctor ends with showing the companions an asteroid in space named RosaParks. I mean. Eh? I really wanted to love this episode. I was a bit thrown off by the first act and introduction of the ‘villain’. But really got into the second act of the episode. Then the whole third act really fell into cliche and over-emotional montages that really took me out of the show. This didn’t feel like Doctor Who to me. At all. Even the ‘villain’ was very…uninteresting. So the writing this episode was extremely hit and miss, the first couple acts were actually really well done. they presented some pretty interesting moments with Ryan and Yaz and a possibly interesting ‘history making’ moment with Rosa. But by the end, I didn’t feel that cathartic celebration that the story tried to build to. I was really reminded of how amazing the Vincent Van Gogh episode in the Matt Smith era was. That episode was by no means perfect, and the invisible spooky monster was a bit cheesy, but oh man did that story hit me hard. I was nearly in tears at the end where the Doctor takes Vincent to the future and shows him the incredible impact he has on the world. THAT kind of story telling is what I wanted from the Rosa episode. Such an iconic woman deserves an impactful moment like that, and I think they quite missed the mark. I can really appreciate and celebrate that this episode was written by the shows first black female writer. It’s really awesome that Chris Chibnall’s writer’s room is the most diverse in the shows history. Maybe it will just take some time for the new team to produce some incredible content. I don’t need sappy pop music in my Doctor Who! I didn’t mind that the composer gave Rosa and Krasko their very own theme songs for the episode, but the end of this episode suddenly turned into a mushy over dramatized mess. It really didn’t feel like an episode of Doctor Who to me. Maybe this episode is appealing to a younger audience, but it really missed the mark for me. Maybe next week’s spooky Halloween spider infestation episode will showcase some classic Who action. We actually got some interesting Yaz backstory! Finally. Ryan also got some strong story moments this week that were really good. He and Yaz got to explore more of their feelings about the situation and their time growing up. Graham was the one that kind of took a back seat in this episode. I have the feeling that three companions is a bit much for the show at this point. It seems that one of the companions has to take a ‘story backseat’ for each episode. They seem to be quickly falling into some writing tropes that worry me. Ryan is the action hero, Yaz is there for emotional support. And Graham is the comedic relief. I know it’s possible to have three companions and a great story. Look at the interesting, convoluted story we got with Amy Pond, Rory, and River travelling with the Doctor. They took on the Weeping Angels and the Silence. I have yet to see a pattern of story telling that this season is aiming for. We’ve been a bit all over the place with the stories, which is not a bad thing, but I don’t know if next week’s spooky spider’s will help or just be another stack of mediocre. The writing was mostly great for Whittaker this episode. I love the quippy, excitable energy she gives off. The total opposite of Capaldi’s grumpy old man vibes. I would love to see Jodie’s phenomenal acting paired with a really moving story though. Last week’s episode felt so right and Whittaker really stepped into the Doctor’s shoes. This week didn’t have the same vibe for me. It was missing….something I can’t yet put my finger on. They’ve almost got a stellar Doctor on screen, I can see the outlines of it peeking through, they just need to dig a little deeper and let her shine. While this episode was a ‘miss’ for me, there were some great moments that I really liked. Vinette Robinson as Rosa Parks knocked it out of the park. Really stole the whole episode. Ryan and Yaz shared a poignant and currently relevant moment about living in a world that’s still trying to figure out how to all get along with each other. The Doctor and her companions got to witness an important moment in history (however cheesy and overdone it was.) The bad can outweigh the good, but still make for memorable and interesting stories that will color how the season is remembered. I think as time passes, and more episodes get added to the lexicon of the season this episode will be remembered for its good moments. Much like the ‘Van Gogh’ or ‘ Punching Hitler’ episodes, the good outweighs the bad in our memories. 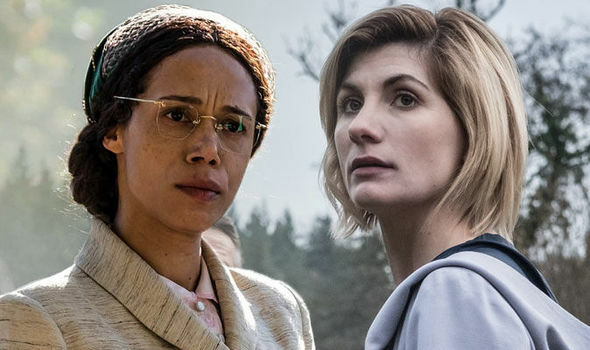 There are still growing pains as the new Doctor, Companions, Showrunner, and writers all stretch their wings, but once they all start finding their groove I think we could have some great episodes headed our way. I appreciate what this episode tried to do and where the writers took the story. I think I was not the demographic they were aiming for. All the new, younger viewers of the show may absolutely love this episode, and I’m totally great with that. I’ll get the stories I’m looking for sooner or later. Next week’s Halloween themed episode could be the fun, silly, spooky episode we need!